Color change tools for color change wraps! 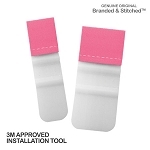 The Pro Pink Slim Pro Pouch has all the functionality of our regular pouch, with a smaller footprint, and the oversized pockets, allow you to hold more tools than the Ultra Slim Pro Pouch. 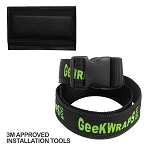 This compact is perfect for keeping your frequently used wrap hand tools nearby. 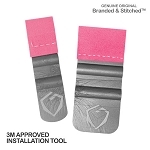 With the three sewn-in Power Slam Magnets, the Pro Pink Slim Pro Pouch can attach to a vehicle or any metal object in close proximity to your work area while holding your favorite tools. Due to the extra weight the pouch can carry, the Slim Pro Pouch is designed to be used with our Mega Tether. Magnetic fields can scramble a credit card's magnetic strip when in direct contact. To avoid this, keep all magnets at least 24 inches away from all credit, debit, rewards, and gift cards with a magnetic strip.